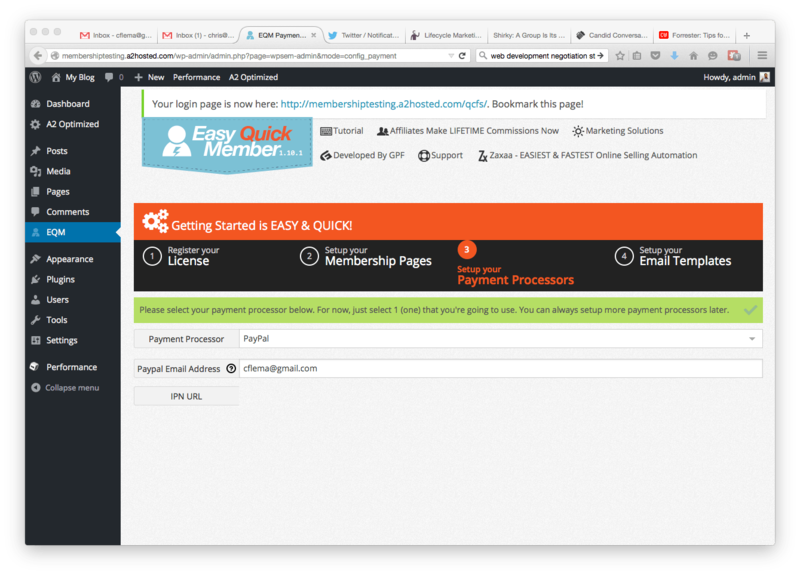 If you head to the site where you can learn about Easy Quick Member, you’ll discover that it has a lot of the features I talk about regularly. In short, it should get a really high score. It’s built by regular folks who aren’t part of the WordPress community, but that’s not a deal breaker for me. Not every developer started with WordPress. Some of them have rich experiences outside of the community and may build amazing products – even if they’re not present at WordCamps and all that good stuff. The company behind Easy Quick Member are also behind Zaxaa – a really cool shopping cart that I plan to write about later. But sometimes coming from the outside also leads to poor choices. For example, their product requires something called ionCube loader. Technically, this is an additional library installed on your server so that they can run encrypted software. Those sound like pretty good reasons to not try Easy Quick Member, right? It requires that your hosting company supports it. And right off the bat many of the great hosts I use don’t. So that means extra work getting it installed. Because I have to use a host that supports this ionCube loader. Mind you, I haven’t even begun to rant against the notion of encrypting software in the open source world. That’s for another day. Suffice to say, that I finally got it installed, activated and licensed. And then I got to a page where something was breaking. See that IPN URL setting. The text box is missing. And if you click on any of the other payment gateways, guess what? Those forms don’t finish either. And I can’t debug it, look at what’s going on, or try to fix it…..
Because of the encryption and ionCube loader. So with that, I’m done. I’m on vacation at the beach. I decided to try to do a post in the day rather than late at night. And I wasted three hours on this. While I don’t like to let my feelings impact my reviews, I can’t help it. As much as the features look great, if you can’t install and configure a plugin, and you can’t install it on mainstay hosts, and you can’t ever debug it, it’s likely not a plugin I’m going to recommend (unless your doctor says your blood pressure is too low). Try any of these. They install and work.